Walk, ride your bike or rollerblade to the party, if possible. Stay away from foods with preservatives and little nutritional value. They aren’t good for your body and can make you feel like you’re slowing down – physically and mentally. Opt for burgers over hot dogs. They generally have fewer (if any) preservatives. Go easy on the condiments. They add empty calories – calories that don’t have much, if any, nutritional value. When possible, choose white chicken breasts over red meat. Drain fat and grease off of the meats you eat. If you have a role in the cooking process, you can build this into the process so that all of your friends and family at the party can join you in taking this healthier route. 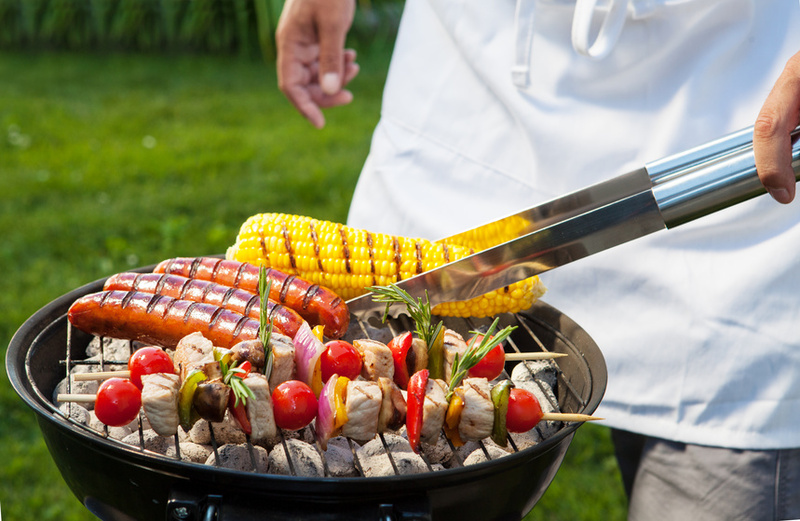 Grill chicken and fish instead of – or in much greater proportion to – burgers and hot dogs. Choose whole wheat bread over potato buns or white bread. Some people may even enjoy gluten-free breads, or you can opt for no bread. Stay away from the chips. If you want a healthy alternative, bring organic rice chips to the gathering. Have a little bread if you want, but fill up on vegetables where you otherwise would have filled up on bread. Grill peppers, eggplant, and corn, and garnish with garlic and a little olive oil (just enough to keep the food from sticking to the grates of the grill). Choose whole fruits over fruit juice when possible. It’ll take you longer to eat and fill you up more. Opt for water or fresh-squeezed or organic juice. If you really have a hankering for soda, mix some of that fresh-squeezed or organic juice with sparkling water for a healthy treat. But most of all- have fun and don’t fret if you find yourself getting off track or if you eat one too many cookies. If you generally keep healthy habits, just pay attention to the quality of the food you’re putting into your body and enjoy treating yourself. We are human and enjoy little indulgences every once and a while. Besides, it is not everyday America has a birthday.